The A-Class is a very space efficient compact car, which was offered in three- or five-door guises and with a huge variety of engines. 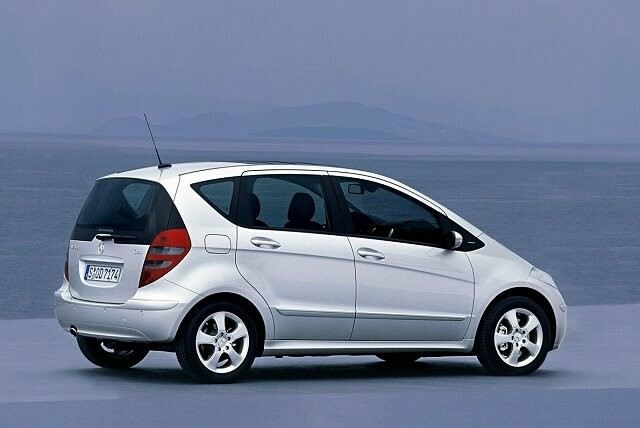 The second generation A-Class followed its clever predecessor by featuring a raised driving position and a twin (sandwich) floor construction into which Mercedes-Benz put all the mechanical components. The result is a very space efficient compact car, which was offered in three- or five-door guises and with a huge variety of engines. That structure also makes it very safe, though it does rather dictate the styling, the A-Class being upright and tall compared to its BMW 1 Series and Audi A3 rivals. Mercedes-Benz’s second take on the A-Class was an extensive re-working of the technology rich formula that was introduced by the first car. This version arrived in 2004 and was replaced in 2012 by a far more conventional (and cheaper to produce) model better suited to competing against its Audi and BMW rivals. Offered in either three- or five-door formats, the three-door is somewhat optimistically referred to as ‘coupé’, though both are upright, mono-box shapes. Not as lithe or sporting to look at or drive as its German counterparts the A-Class majors on space; it's more a compact MPV in its proportions inside than compact hatchback. So space is good, and many will appreciate the commanding driving position, which gives a great view across most traffic and makes it relatively easy to park. The range Mercedes-Benz offered internationally was comprehensive, though the Irish market seemed to embrace the 1.5-litre petrol A 150, with a handful of A 170 petrol and A 160 CDI turbodiesels also available in the classifieds. The three-door variant is the smarter looker and loses little in interior space to its five-door relation - though obviously access to the spacious rear isn’t so good. In 2008 the A-Class was facelifted, with the front and rear lights being revised and Mercedes adding some additional standard equipment inside. Being a Mercedes-Benz, safety was a key consideration, that sandwich floor helping the A-Class perform particularly well in crash tests, while ESP (stability control) and a large airbag count features in all. With plentiful choice the A 150 is the easiest car to find in the classifieds. It’ll not set your pulse racing with its relatively modest 95hp, but then the A-Class isn’t the sort of car you’ll be tearing around in. The five-door is the better, more practical choice. Five-speed manuals are standard, but the occasional four-speed automatic is offered - though it does negatively impact on economy and emissions. A prestigious badge on a useful, if somewhat awkwardly styled and unconventional hatchback. It's safe, solid and dependable, if not the last word in excitement to drive. If you want an economical, clever hatchback then the A-Class has merit, but you do pay a bit for that badge over some more mainstream offerings.